There goes the hotel’s electricity. Never really thought about it before but big buildings constantly breathe, and without the air exchangers or whatever running the silence is uncomfortable. All I can hear are my ears ringing. The windows pass some grey light, twisted by thick ribbons of rain on the glass. Palms thrash in the wind outside. It feels like Jurassic Park — the original, before the dinos get loose. And like John Arnold trying to reboot the fences, my face is lit only by my computer screen as I try to get some work done. Hold on to your butts. Lightning strobes and thunder booms on cue. The Texas stereotype of everything being bigger and more is proving true: this is the second storm in as many days and an aftershock of the storm that dumped twenty inches of rain on Houston earlier this week, flushing muddy fresh water into Galveston Bay and flushing the redfish out to saltier water. But I brought an eight weight and my wading boots from Minnesota. If the lightning quits I’m gonna use them so I’m on Google Maps and Weather.com. The only saltwater fish I’ve ever caught on a fly is a flounder and I can’t pass up a chance, even a small one, at a trout or a redfish. Tomorrow. Next day early afternoon I’m parked roadside in the Anahuac National Wildlife Refuge. The drive from Houston improved my mood which was surly after a two-hour wait in a sweaty rental car office. Apparently all the privately-owned cars in Houston got flooded. But once out of there, the road devolved from six-lane freeway to rural highway to unpainted farm road with cattle grates to a dirt dead-end in the NWR — like following an ever-smaller tributary upstream, narrower and cleaner as I went. This Chevy Cruze has probably never been outside Houston and the engine lopes nervously in the wide open space. Just wait until I get in with my muddy wading boots on. I lace up under the disinterested eye of a huge brindled bull, egrets stalking between his legs. 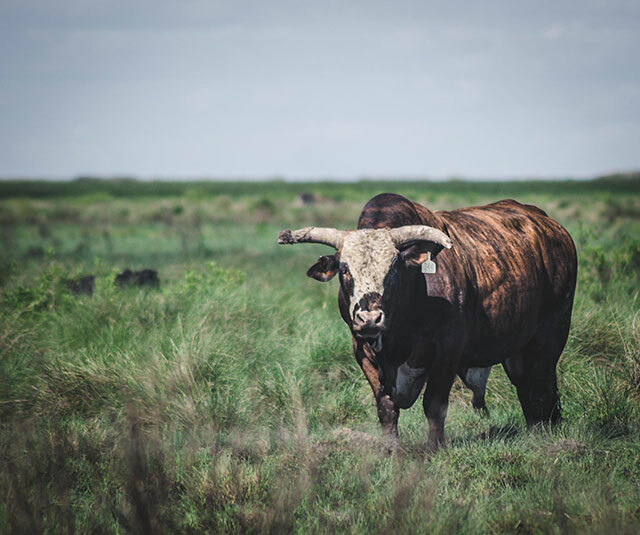 It’s a bit odd, and very Texas, to have barbwire fences and cattle in a National Wildlife Refuge; on the other hand cows have watched anglers rig up for generations in the Midwest, so it feels auspicious. Opposite the bull, East Bay churns chocolaty around riprap reefs. Silvery baitfish of unknown taxon leap, in either glee or terror, in the shallows. As I align rod sections I think about the flats and surfs of the Great Lakes, where I spend a lot of time and so far have successfully avoided death by lightning, drowning, hypothermia. The lakes can kill you if you’re careless, and the Gulf of Mexico is not different in that sense. But there is one extra factor here. While the lakes present a kind of passive, environmental danger, the Gulf is home to creatures that can actively kill you. A bunch of them. But I’ve read up on it. I’m not carrying smelly bait or headed into the marsh so sharks and gators should be no problem. My heavy boots and long pants should protect me from jellyfish. And I know to watch for any of a dozen different venomous snakes. The only real danger are the stingrays. Stepping on one earns you a world-class painful wound and a dangerous infection. Just shuffle your feet, everyone said, but internet searches reveal plenty of shuffling anglers who got nailed. You’ll see them, another friend said. Not in this water, the color of gas-station cappuccino. I pause for a moment before stepping in. The water is warm and the bottom is muddy but hard. Reminds me of Saginaw Bay on Lake Huron. Marl, rock, and grass in similar proportions — just a lot more. And the mud is stickier and smells worse. More birds; more variety. More baitfish. Even some of the rocks prove to be clumps of oyster shells, which are like Quick Crete mixed with razor blades. I can’t see them in the muddy water and they cut off flies without warning and grind years of life from my freshwater Vibram soles. I shuffle along, casting inward and out. Various shorebirds I don’t know the names of hunt along with me. Sometimes the baitfish make a spelunking sound exactly like that of a nice brown trout eating a drake spinner and my brain shorts out a little. There is a psychological cognitive bias known as the Dunning-Kruger effect in which an unskilled person is not able to accurately gauge his or her own incompetence — in short, I don’t know what I don’t know. I do know how to cast a fly and strip it back in. But there could be a thousand other variables: retrieve speed? Depth? Cast to shore or out? Fly color? Leader length? And so on. But then I hook a fish. Instantly obvious is the vibratory circular fight that the flat fishes have, both bluegills back home and this one — flounder. About a foot long, the color of mud, smooth and firm; somehow feels like food in the hand. He must know this about himself and he defies me with one eye while the other stares out to sea, perpendicular mouth hinging left and right. Lucky for him, my hotel has no kitchenette, but as he flashes out of my hand I get the feeling that to him, catch and release is detestable weakness. The next fish pulls conventionally, and harder: a spotted trout of sixteen inches or so. His black spots do have a Salmo trutta look but the deep pearlescent flanks in the evening light set him apart from anything in fresh water. As do his dorsal spines, oddly symmetrical canine teeth, and the soft grunting he makes as I cradle him in my hand. This next moment is one of the best that flyfishing offers: the lingering release, eyes and hands savoring an extended transition from captive back to wild, as the fish slowly realizes that he can escape at will. But this time, when he slips from my fingers a crab has appeared from nowhere, attached to his tail with a death pinch. The trout and I are both shocked — on his side, he sinks quickly out of sight, one eye facing me, finning a bit but seemingly resigned to death. I head back to the car and climb in, sticky mud soaking into the carpet. The sun is setting over the bay and the myriad shorebirds and waterfowl are silhouetted in an absurdly picturesque way. But they barely register. Just as I was starting to feel comfortable with my shuffling, confident in my angling, excited to add a new species to my list, all it took was a medium-sized blue crab to remind me that the ocean is a big scary place, and I’m far from home.